Sundays when you do nothing but recover from the week/end, drink coffee then beer on the couch and watch television. Sundays when you get out and have lazy social time with friends. 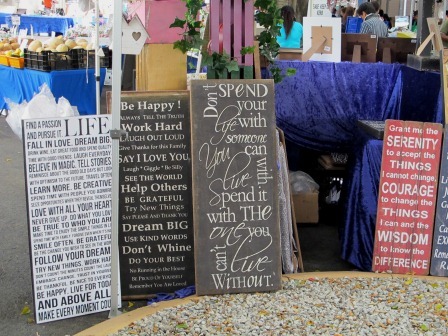 Neither is better, each is wonderful in its own way. Personally, I find when I spend Sunday afternoon out, it distracts me from thinking about the impending work week. Oddly though, I can feel guilty when I’m out enjoying myself on a Sunday rather than staying at home ‘resting up’. Find the logic in that. Anyway, I’ve had a great couple of Brisbane Sundays recently. 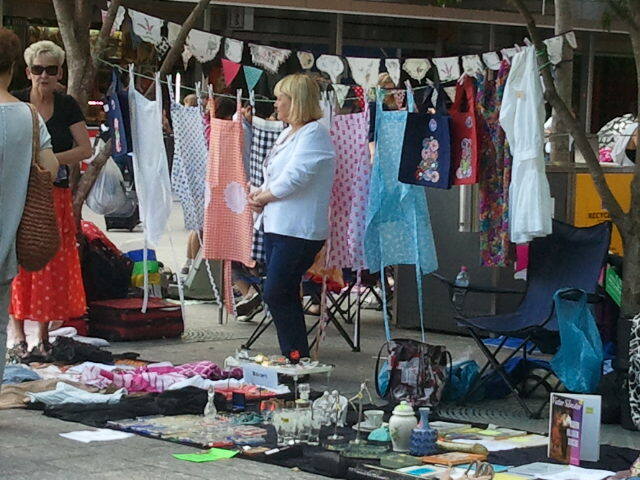 Last Sunday I paid my first visit to the Eagle Farm markets. 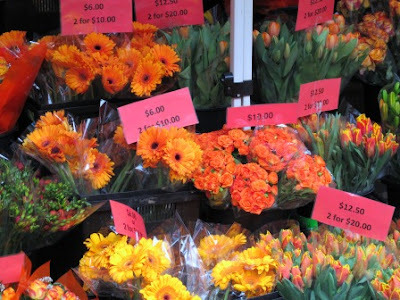 Now that I’m a north-sider these are my new local fresh food markets and being a lover of markets in all forms, I couldn't put off my first visit for long. So I dragged myself out of bed on a cloudy and windy Sunday to get to the markets and pick up weekly necessities like baby roma toms and smoked bacon. When I arrived, the cheap-skate in me grumbled a lot about entry into the markets costing Twice As Much for Eagle Farm than Rocklea ($2 rather than $1. $2!). So cheap sometimes. 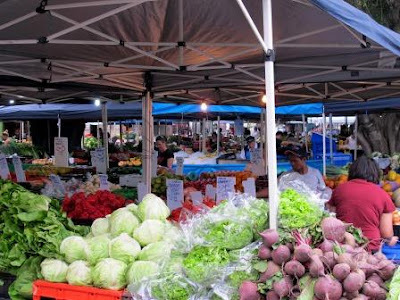 Eagle Farm is significantly smaller than either the Rocklea or West End markets. 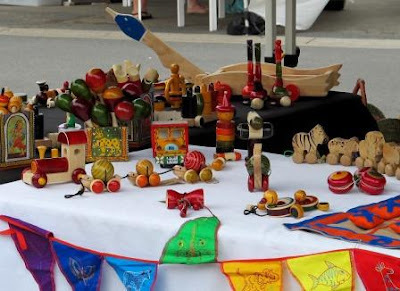 However, many of the stall holders are the same and there is one of just about everything. 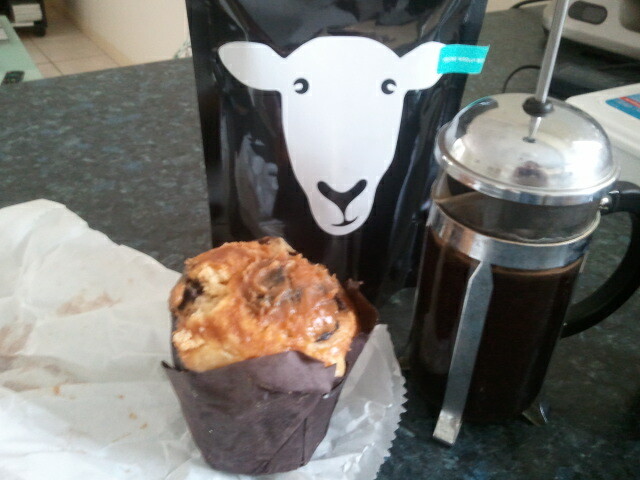 I had lovely chats with Black Sheep Coffee Guy, Jus Oils Couple, the Bacon Ladies and Egg Man. I'm a chatty person. The two separate food stall sections were giving off the most wonderful aromas of baked and fried breakfasts, but I got seduced by a mars bar muffin, which I took home to enjoy with my freshly ground Black Sheep Coffee. Good espresso puts me in an expansive mood. 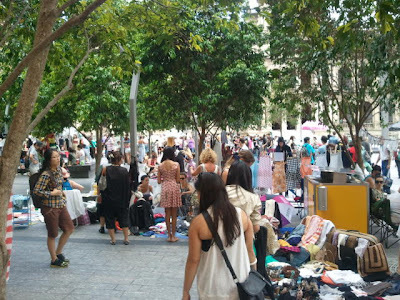 This Sunday I tripped into the CBD to check out Suitcase Rummage. 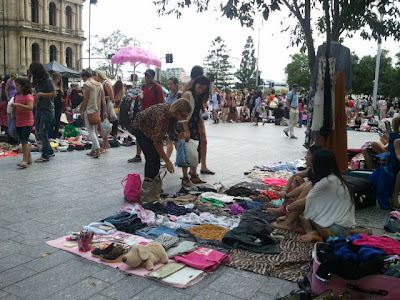 This ingenious idea for a market has been happening in Brisbane for a few years now. Held on the first Sunday of every month, it is an opportunity for people to ‘sell like their Grandmas’. You take along suitcases full of stuff you no longer want, lay it out and wait for someone to decide your trash is their treasure. It was a scouting rather than a shopping expedition. I’m thinking of participating with my own suitcases in December so it was important I saw how the rummage worked for stall holders. 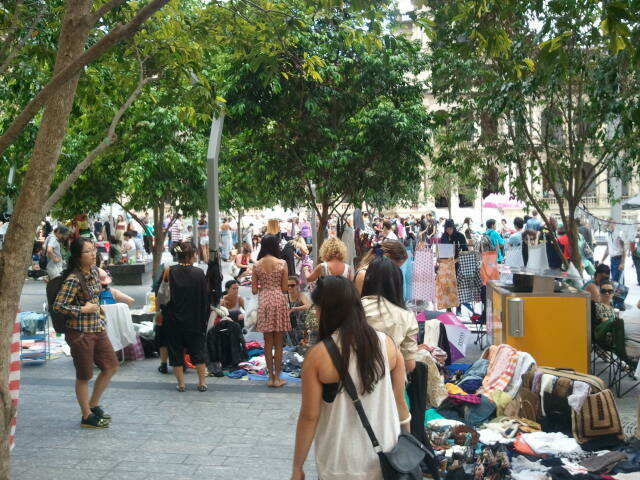 Suitcase Rummage was a lot busier than I had anticipated. 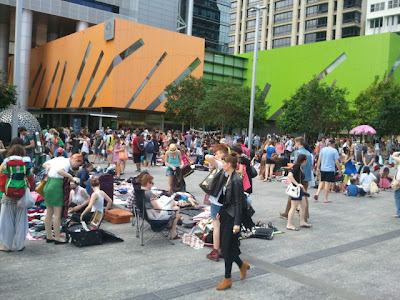 Whereas the Mall was quiet and the rest of the CBD positively deserted, Reddacliffe Place (at the top of the mall, outside the Casino) was packed! In the afternoon, I gathered with friends at Lady Lamington for the first in the long series of pre-christmas get-togethers. 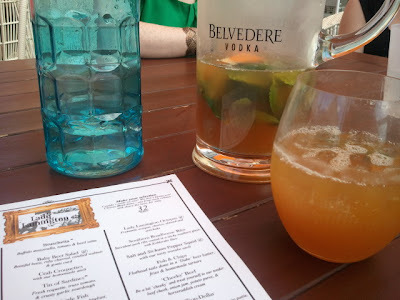 My first visit to Lady Lamington and it was a perfect place to spend a sunny Brisbane Sunday. The food was very tasty, and I made a mental note to return for the Roadhouse Ribs and the Big Breakfast, the cocktail jugs weren’t too alcoholic and went down smoothly, and the location oddly charming. 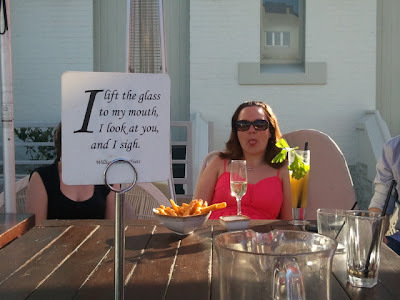 Our only gripe was the one waitress with Attitude but she was the exception and not the rule. No good photos I’m afraid because as pretty as it was, I was just too mellow to snap shots of cocktail jugs, colourful beautiful people and glorious Brisbane sunshine. I drank Pimms instead. Then went for Harajuku Gyoza, the perfect way to wrap up a great day out.